Life is not one speed, sometimes you want to mash your way uphill to work, sometimes you want to take it easy. Shifting is very smooth, easy to operate, and intuitive. 3 gears span a range similar to a 10 or 12 speed, but with fewer increments. Middle gear is equivalent to our single speed gear. Switch to a lower or higher gear with the flick of the wrist. First gear has less resistance and allows you to spin your legs faster, or take it easier up hills. 3rd gear has high resistance and allows for a higher top speed, making the bike more versatile. To read a short article about the benefits of the internal gear system, please click here. 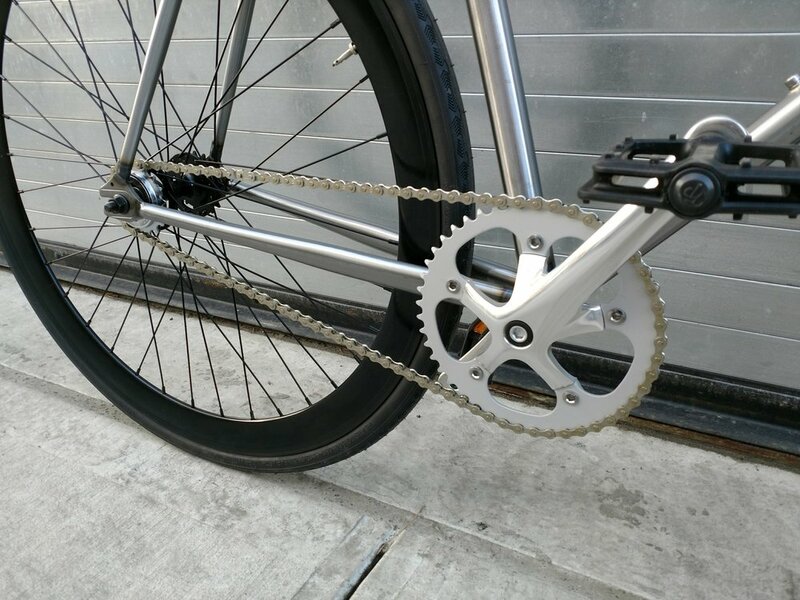 We chose our single speed gear ratio as the best single gear for city riding. Advanced, stronger riders sometimes upgrade to a heavier gear, making uphills more difficult but increasing top speed downhill. Without the option to shift gears and spin your legs faster, you will find yourself standing up more and using your core strength to go uphill or accelerate from a stop. Flip flop rear wheels, so you can ride single speed or fixed gear. Our seven speed builds use the Shimano Nexus 7 Speed internal gear system. Just like our 3 speeds, an internal gear system has many benefits over a "normal," external gear cluster. If you are wondering why other brands have 3 and 7 speeds priced equally, it is because the 7 speeds are external! Compared to our three speeds, the Nexus 7 has a wider range of gearing (lowest gear is lower, highest gear is higher), more increments between gears, as well as a general overall higher quality of the wheel. Brooklyn is relatively flat and does not necessarily require multiple speeds. Some of our customers riding vintage road bikes (10 or 12 speed, etc) report that they only shift to go over the bridges. However, a modern 3 speed is easier to use and riders generally find themselves shifting more often! Do I need more than 3 gears? Most of our customers find 3 speeds to be enough. The range of gears is wide enough to tackle any of the bridges, and there is never any question about which gear you want to be in, or if its better to use the left or right shifter. Three speeds may be insufficient if you need to ride up very steep hills, or if you like to have subtle options about your cadence (the speed/RPM of your pedal stroke). We are confident that you will be very pleased with the gear ratios that we have selected for our bikes!